SQLCipher takes care of data security behind the scenes with a small footprint and great performance that makes it well suited for protecting application databases on mobile platforms. SQLCipher .NET packages are only available through our Commercial Edition licensing via the link below, or through the SQLCipher Enterprise program. There are several ways to setup local NuGet repositories, including file shares, global Visual Studio settings, and even running a NuGet web repository. However, one simple, flexible, and recommended approach is to store the SQLCipher NuGet packages alongside the project itself. This approach ensures that the dependencies are stored in version control alongisde the application, that the packages are instantly available to all developers and build tools, and that the dependencies can be fulfilled even offline. Note that this approach works both with Visual Studio for Windows or Mac, though the former is used here for demonstration purposes. Start by copying the appropriate .nupkg filesinto a folder under the root of the application. It is even possible to place the package(s) in the top level folder of the application sources itself alongside the Solution (.sln) file. Next, create a simple nuget.config file in the same directory as the .sln and .nupkg files, that points a package source to the directory where the .nupkg file(s) are located. 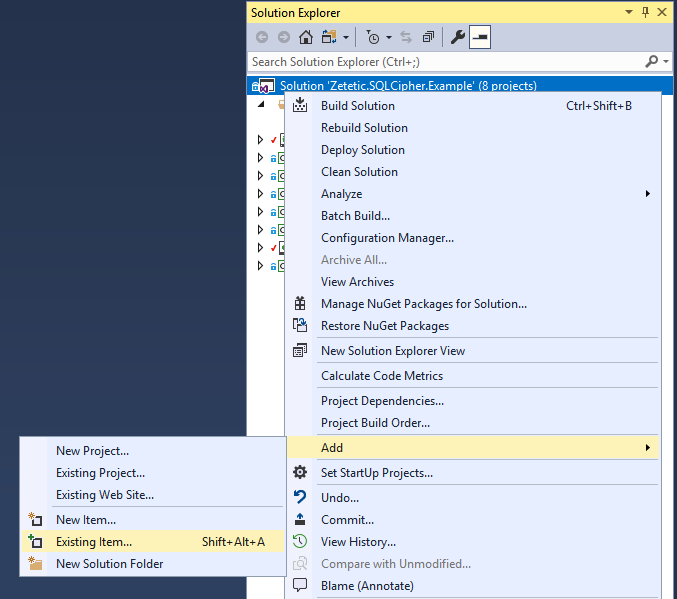 Finally, in Visual Studio, add the nuget.config file at the solution level, save the solution, and restart the IDE. The nuget.config should now show up as a Solution Item. Once the NuGet configuration is complete you will be able bring up the NuGet package manager and select the Local source to install the appropriate SQLCipher package at the project level. SQLCipher packages should be installed to the executable / Applicaiton project. For example, consider a multi-target Solution that includes a Xamarin.iOS application, a Xamarin.Android application, and a Windows 10 UAP application that use a shared data access project. In this case, the platform-specific SQLCipher packages zetetic-sqlcipher-ios, zetetic-sqlcipher-android, and zetetic-sqlcipher-windows-uap should be each be installed to the respective project. For Xamarin.iOS you will also need to call one additional method, SQLitePCL.lib.embedded.Init(), to instruct the Xamarin linker to properly bundle SQLCipher, i.e. Once the appropriate project-specific packages are installed you can choose the desired client libraries for accessing databases. 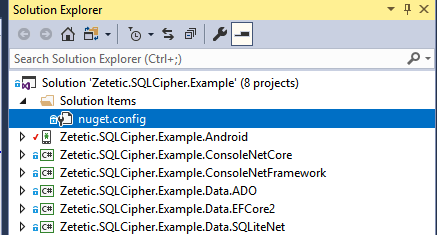 SQLCipher supports multiple APIs for accessing data: sqlite-net, Entity Framework, and ADO.NET. Details on each integration approach are included here. SQLCipher ships with a sqlite-net compatible package based on the official praeclarum/sqlite-net library. To use this interface, make sure that zetetic-sqlite-net-base-X.X.X.nupkg is present in the local NuGet repository and install it to the project. The following example provides an abbreviated code sample for using SQLCipher via the sqlite-net API, where the key material is passed to the constructor. Note that a fully functional referece application is included with each SQLCipher package to demonstrate library usage. SQLCipher supports the use of Microsoft Entity Framework Core. To use this interface, add a NuGet dependency on Microsoft.EntityFrameworkCore.Sqlite.Core version 2.x or higher. The following example provides an abbreviated code sample for using Microsoft Entity Framework Core where the key material is passed to via PRAGMA. Note that a fully functional referece application is included with each SQLCipher package to demonstrate library usage. SQLCipher supports ADO.NET via the Microsoft.Data.Sqlite.Core 2.x library. To use this interface, add a NuGet dependency on Microsoft.Data.Sqlite.Core version 2.x or higher. The following example provides an abbreviated code sample for using the ADO.NET Adapter where the key material is passed to via PRAGMA. Note that a fully functional referece application is included with each SQLCipher package to demonstrate library usage. Applications that are simultaneously targeting multiple platforms (e.g. Xamarin.iOS and Xamarin.Android, Windows 10 UAP, etc. ), should place their shared data access code in a separate project that depends on the appropriate data access library. Then install the SQLCipher platform NuGet package(s) and the data access library at the platform-specific project level. If you have addition comments or questions please contact us.